Of all the Wasps species in Australia, the main one that causes concern for humans is the European Wasp. They were first found in Melbourne in 1977 having arrived in Tasmania 18 years earlier from Europe. European Wasps live in colonies located in the ground, around railway sleepers, homes, under eaves, in pergolas, garages, sheds or in vegetation areas. A European Wasp nest can contain up to 100,000 Wasps and they can become more aggressive as their numbers increase. If you need to get rid of Wasps, you need a Pest Controller and we are here to help you with Wasp removal, give us a call now. European Wasps aggressively defend their nests, if disturbed. They will also attack if provoked. They are often found in picnic and barbeque areas looking for the sweet foods and drinks that go along with these activities, so keep food and drinks covered, and avoid sharp movements. 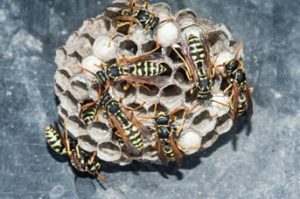 Only a professional Wasp exterminator or Wasp removal specialist, such as; Control-A-Pest Pty Ltd, should approach active Wasps. Unlike Bees, Wasps can repeatedly inflict painful stings, which in some cases can be life threatening. Consideration should always be given to seeking medical attention for a Wasp sting, especially where there are multiple stings, or there is a sting to the throat or where the person is allergic to the venom. A professional Wasp exterminator, Control-A-Pest Pty Ltd can provide you with assistance in Wasp extermination. European Wasps also cause problems to many horticultural and manufacturing industries and is said to be a threat to ecosystems. 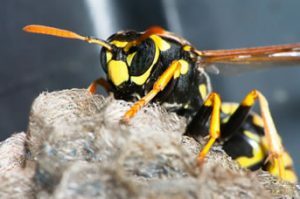 If you have a problem with Wasps, call a professional pest controller, call us here at Control-A-Pest Pty Ltd for advice and eradication of Wasps, contact us now.